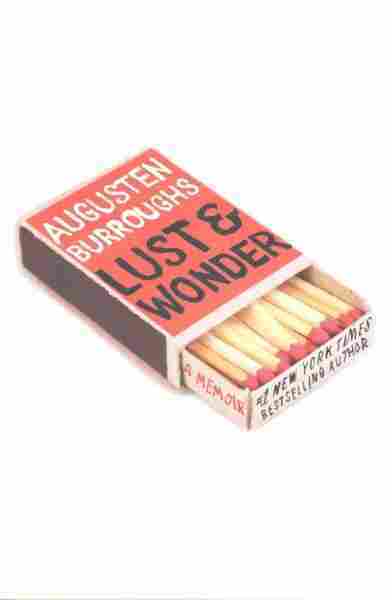 Book Review: 'Lust and Wonder' By Augusten Burroughs Writer Augusten Burroughs has grown up on the page, in a series of unvarnished (and sometimes unhinged) memoirs. His latest is the story of a man trying to stay sober, stay in love and not blow it. It's an odd thing, watching a memoirist grow up on the page. Most writers (and we're talking about a specific subset of writers here — those afflicted by the autobiographical blabbermouth disease) have one in them. They reach an age, glance back over their shoulders and see a book waiting there. For most mortals, 300-some pages is enough to contain all the tales of childhood weirdness, drinks and drugs, failed love affairs and the slow, lumbering trudge into age and wisdom. Some fantastic messes or geniuses have two. And then there's Augusten Burroughs. Dude is a superhero, and his power is turning himself inside out in your hands. He's been doing it for more than 15 years, cranking out detailed, book-length dissections of his spectacularly strange and damaging childhood, his bootstrap career as an advertising copywriter, his alcoholism and subsequent recovery. His latest is Lust & Wonder — which, as the title suggests, is a restrained and academic study of antique-jewelry collecting and amateur gemology. Okay, that's a lie (kinda). He does spend what feels like an inordinate amount of time talking about his gemstone addiction, but Lust & Wonder is Burroughs looking back on his love life (something which has not exactly been absent from his previous memoirs) and dissecting the fallout of his various mental illnesses over the course of three major relationships. It's the story of a man trying hard to fall in love (and stay sober, and write books, and control his impulse-buying of $10,000 pinkie rings online), stay in love and not blow it at every possible turn. "I wanted to be somebody who made plans and had friends and knew when the farmers market was in the neighborhood. I wanted to be spontaneous and informed ... As opposed to suggesting, yet again, that we have sandwiches and watch old movies on TV — and not even toasted sandwiches, because that's just extra work for nothing." For most mortals, 300-some pages is enough to contain all the tales of childhood weirdness, drinks and drugs, failed love affairs and the slow, lumbering trudge into age and wisdom. Some fantastic messes or geniuses have two. And then there's Augusten Burroughs. Spoiler alert: He eats the untoasted sandwiches and watches the old movies on TV. And he does this over and over again for a long time, because Lust & Wonder is not really just a simple story of a gay man, a writer, an antique-gem enthusiast and a recovering alcoholic trying to find love in New York in this weird modern age, but a Sisyphus story, the tale of a man doomed to make the same mistakes over and over again until he learns that the true nature of insanity is doing the same thing but expecting a different result. It's a therapy story, but not really. Has the And-he-was-right-in-front-of-me-the-whole-time love story arc of a one-tissue Hollywood rom-com, but isn't. Because this is Augusten Burroughs, and if you've spent any time reading Burroughs (which I have; I feel like I grew up with him), you know that his books are memoirs in the purest possible Colombian cocaine sense: one sentence about a thing that happens, and then three pages of what Augusten thinks about that thing. Uncut Burroughs, no filler. Which sounds like it would be tedious and terrible, but is absolutely not because, again, this is Augusten Burroughs. He's got a beautiful sense of rhythm, a preternatural knack for knowing the precise point at which graceful self-deprecation (coming from a successful New York Times best-selling author) tips over the edge into smarmy humble-bragging, and stops with his toes wiggling just on the edge of the bank. "As much as he loathed my little house, he did like being in rural Massachusetts. And because my career hadn't failed as I'd expected and because I was now part of a couple instead of part of a suicide pact with other survivalists, we decided to sell my little house and build our own new, vastly superior house in the next town." And of course, this is then followed by pages and pages of how Burroughs feels about this, and it's all funny and sad and tragic and relatable at the same time because that's his magic. He came into the world broken and all he wants to do is tell you about it, in the funniest way possible. He was a terrible person yesterday, and he wants to tell you about it. He was lazy and cruel and selfish and a mess yesterday, and over Diet Cokes and cheeseburgers, he'd like to tell you how bad it all was. Then tell you that today, though, things are looking better. That today might be the day it all turns around. Jason Sheehan is an ex-chef, a former restaurant critic and the current food editor of Philadelphia magazine. His memoir is called Cooking Dirty.